The Japanese House has been an artist to watch, ever since she (Amber Bain) burst onto the scene back in 2015 with her debut single, Still. It was a strong ambient synth pop introduction to the music world of Amber, the track being produced by fellow label mate George Daniel, drummer ofBrit champions The 1975. Amber’s latest tour is off the back of releasing her debut album, Good At Falling, earlier this month, which feels like a mature step forward from her previous work. Everything sounds more polished and refined, while lyrically addressing more personal life experiences. The night kicks off with Fake Laugh, who plays a solo set, with his guitar and laptop in hand. On record Fake Laugh sounds like a merge between the laidback indie style of Mac De Marco and the 60s surf rock style of the likes of The Beach Boys. While some of these elements are noticeable in the solo live performance, the sound is a lot more minimalistic, with a simple electronic beat, and guitar and vocals over the top. Fake Laugh captivates the audience with little interaction with them, instead allowing the music to do the talking. Its 9pm, the room is pretty much full of people struggling to get to the back of the room to buy a pint, when the lights go down. The ambient electronica track Went To Meet Her (Intro) introduces the crowd to The Japanese House, with people ditching their attempts to get a pint in favour of trying to reclaim their positions in the crowd. They launch straight into crowd favourite Face Like Thunder to which the crowd shows their appreciation and goes mental. On face value, The Japanese House look like a naïve mix of stereotypical young indie kids, who produce the standard stereotypical indie pop tunes, but when they dive into the set, you get a real sense of something different. 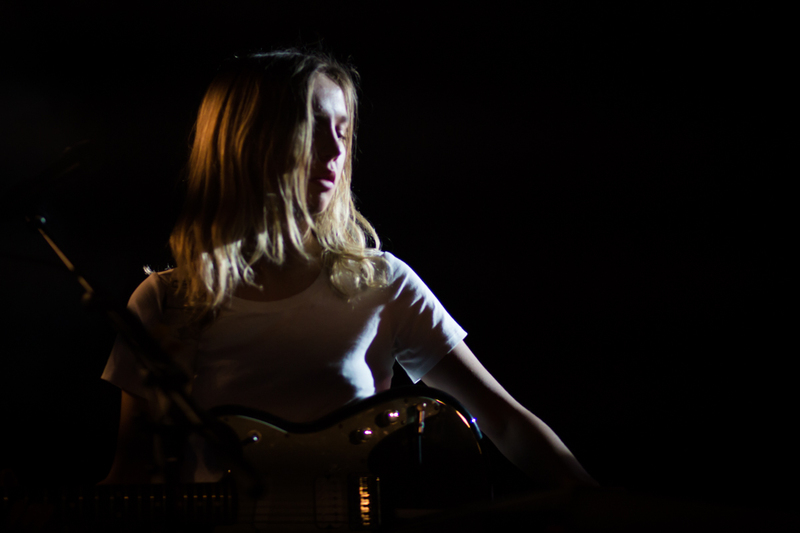 Vocal harmonies and heavy synths, mixed with bright, 80s reminiscent guitar licks provide The Japanese House with a unique formula that captures the hearts of everybody in the room, young and old (especially the dads bringing their daughters to the gig). Amber weaves her set through classic original’s such as Cool Blue and Still and newer songs, showcasing her sophisticated album, such as Everybody Hates Me Now and We Talk All The Time, with each song captivating the audience more and more, with the shouting and screaming getting louder and louder after each song. Amber’s connection with the crowd is fantastic, with each member of the crowd feeling personally addressed as she gives them all the odd smile and wave. The set slows down for a couple of songs in the middle, with Sister/Everybody Hates Me Now and Saw You In A Dream showing a more delicate side to The Japanese House, as the songs are stripped back and the main focal point is her voice. This shows a great range in Amber’s songs, there is literally something for everyone. Amber draws the night to a close with Clean, one of her first singles released, which sees the whole crowd bouncing as one, wishing for this moment to never end. Intricate guitar riffs, over the top of ambient synths and electronic beats, with vocal harmonies galore sum up The Japanese House perfectly, in what seems like their defining song. The world is yet to see all that The Japanese House has to offer, expect big things in the future if the current progression is anything to go by. And if you’re going to any festival they’re playing this summer, such as Dot 2 Dot, make sure you don’t miss out.